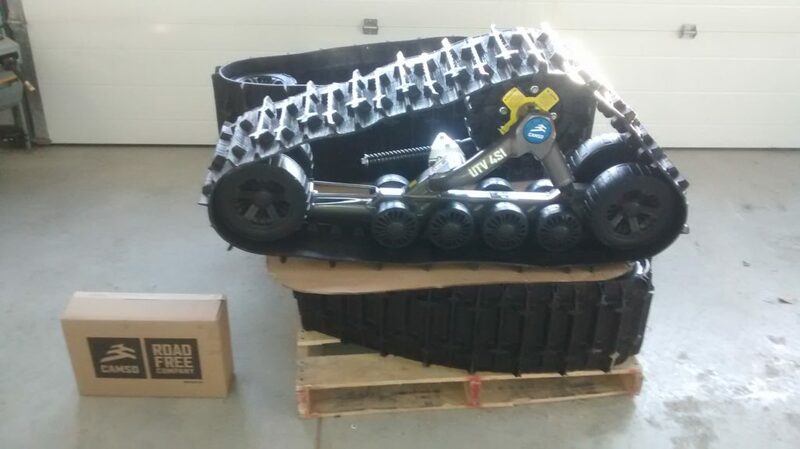 New sets of 2018 Camso UTV 4S1 tracks have arrived at Whitecourt All Terrain. We are very excited about the arrival of the new Camso 4S1 UTV track sets. Camso has been continually improving track designs over the years and the 2018 4S1 tracks have really raised the bar. You can see the structural improvements immediately, but that is not all that is improved this year. Along with structural improvements that have improved strength, stability, ride comfort, and have even eliminated the need for greasing, there have also been convenient changes that aid in making adjustments and simplify servicing. The new 4S1 track system is not only going to allow us to offer improved tracked side by sides rentals, it is going to improve our ability to offer the best maintained, highest quality side by side, Argo, and quad rental fleet available. Reducing the maintenance required to keep our tracked side by side rentals in service means we will have more equipment available to rent at an given time! Enhanced wheel seals, tandem stabilizer bar, and rubber mounted wheel shafts, along with tire and track improvements have reduced friction and wear, stabilized handling, improved performance, reduced maintenance and increased overall track life. We were so pleased with the improvements that we have already installed and tested a set this week. These are currently available for rental. Give us a call to get these tracks working for you. 2018 Camso SxS 4S1 track system. Tracked side by side rentals in Whitecourt Alberta.